Foodies, take note! It’s time to make some room in your fridge and freezer, the prestigious Australian Grand Dairy Awards has announced its 2018 Champions, revealing the top 18 dairy products in Australia. Melbourne’s Montefiore Cheese caught the eye (nose and tastebuds) of the judges, with the cheesemaker taking out the 2018 Grand Champion Cheese with its soft and sweet Ovoline. The 2018 Grand Champion Dairy Product was scooped up by Sydney based Pure Gelato, for its deliciously nutty Salted Pistachio Gelato, which expert judges commended for its superb texture and rich pistachio flavour accentuated by a hint of salt. The awards consumer judging panel agreed, voting this gelato as their pick of the bunch. For the second year running the Australian public were also invited to vote for their favourite Australian dairy product in the People’s Choice Award. More than 13,179 votes were cast to reveal The Yoghurt Shop Passionately Passionfruit Yoghurt as the 2018 People’s Choice Award winner. 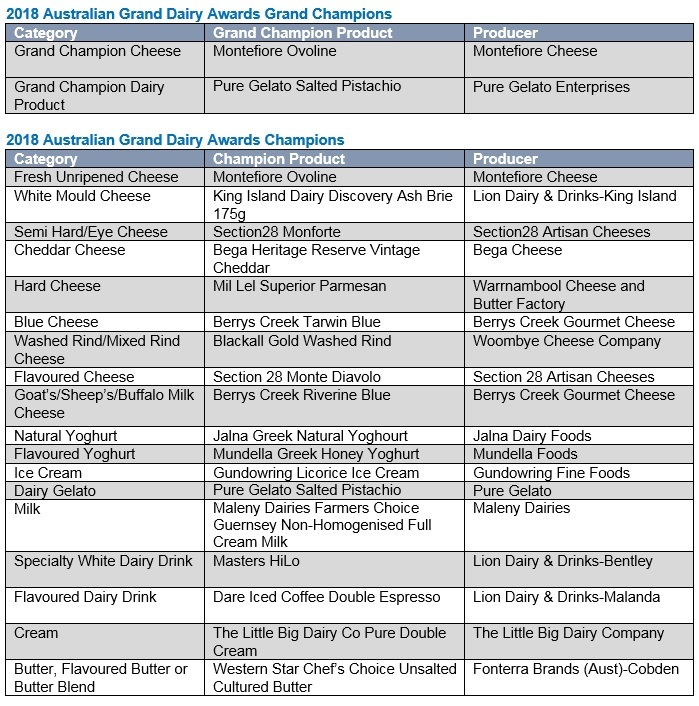 Now in its 19th year, the Australian Grand Dairy Awards recognises and rewards Australia’s top producers and their expert craftsmanship across 18 product categories. In a rigorous judging process, 22 dairy experts sampled hundreds of gold medal winning products to crown their Champions. Flavoursome cheeses, sensational ice creams, luscious milks and velvety yoghurts, among other products, were thoroughly assessed for flavour, aroma, texture, body and appearance. The coveted list of Champions includes dairy producers big and small. From the herbaceous Monte Diavolo by 3-year-old Section 28 Artisan Cheese out of Adelaide Hills, to Western Star’s much-loved butter churned from a 90-year history in Western Victoria, young and old alike rose to the top of the Champions list. Amanda Menegazzo, convener of the Australian Grand Dairy Awards said, “The awards are the crème de la crème of dairy and a fantastic opportunity for local farmers and producers to be recognised on a national scale for their talent, hard work and making a positive contribution to the dairy industry. Established in 1999, the Australian Grand Dairy Awards are Australia’s most prestigious national dairy awards and the highest accolade for Australian dairy producers.